From volumized updos and slicked back ponytails to closely cropped locks and deep partings with tumbling waves, there have certainly been some amazing hairstyles on display at London Fashion Week. With so many to choose from, we’ve picked the top 4 trends we’ve seen and the best products you can use to get the coveted LFW looks! Choosing a shorter style, as seen on the Topshop runway above, can create natural body and bounce. Add colour to the mix, and your hair is given even more texture and movement. When going for golden, ombre tips, keep your ends healthy with a once or twice weekly pre-shampoo conditioning treatment. This can be applied all over the hair once a week 20 minutes before shampooing, and also to the very ends only and left on overnight if they feel particularly dry. Before blowdrying your hair, apply a heat activated, heat protective styling serum over your mid-lengths and ends. We recommend PK Straight Hair, which not only guards against heat damage, but also helps to keep your hair straight and kink-free until it is wet again. To create maximum volume, part your hair in sections and liberally spray a volumizing product into your roots. Blow dry on medium heat and smooth away any wisps with a medium-weight leave-in conditioning cream, such as Philip Kingsley Smooth Cream. Finish off with a centre parting to be right on trend. If your style drops towards the end of the day, or if you wish to get a slightly more textured look, spray a fine dry shampoo into your root area. Disperse with your fingers, and turning your hair upside down quickly brush through with a large paddle brush. Flip your hair back over your head and voila! Braids of all shapes and sizes were on display throughout fashion week in both London and New York. The above example from the Gyunel catwalk being a fabulous way to add an element of romance and edginess to a simple updo. However, consistent use of tight braids can cause a type of hair breakage/ hair loss known as traction alopecia. Either incorporate loose, whimsical plaits into your style, or if the style calls for a tighter braid do not leave it in overnight, or do it too often. It’s all about moderation! To keep braids from coming apart or frizzing, apply a weatherproof hairspray to your hair before styling and then again after – and seal off the ends of any braid with a texturing paste. To prevent snappage, gently remove any knots when taking out braids with a nourishing detangling spray. 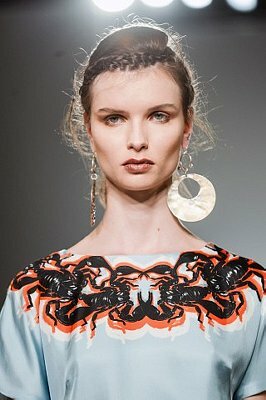 We fell in love with the glossy waves and side partings of the Jeanne-Pierre Braganza show. The best way to create this lasting shine is to apply a good post-shampoo conditioner formulated for your hair texture to your mid lengths and ends, gently comb it through with a wide-tooth comb, and rinse until the hair still feels soft, but not coated. This smoothes the cuticle, allowing your hair to reflect light brilliantly. For heat protection and definition when curling, start by applying a heat protective spray and a ‘barely there’, shine enhancing smoothing cream to towel dried hair. After blow drying your hair into a deep side parting, part your hair in sections and wrap the bottom half of each section around medium barrelled tongues, making sure that you are curling the hair in the same direction to avoid an uneven finish. To keep damage to a minimum, do not to leave the heat on your hair for too long. Set your style with a fine misting of a weather resistant, frizz fighting hairspray, and lightly brush through to loosen the curls. Two days later, give your hair a good dose of Elasticizer to replenish any lost moisture! Updos on the DAKS runway made us reminiscent of old school Audrey Hepburn glamour, while at the same time added a modern twist with textured volume. To get the body & texture as seen above, lightly towel dry your hair after shampooing and conditioning and work a weatherproof styling froth into your roots. Blow dry your hair with the heat of the dryer directed back towards your face and use a large vented paddle brush to lift and set the front section in place. Pin back with bobby pins and set with a weather resistant hairspray. If you’re styling your hair from dry, mist on PK One More Day Dry Shampoo and brush through. Follow with a generous application of PK Maximizer to your root area, and gently create extra lift with your hairdryer on medium heat.